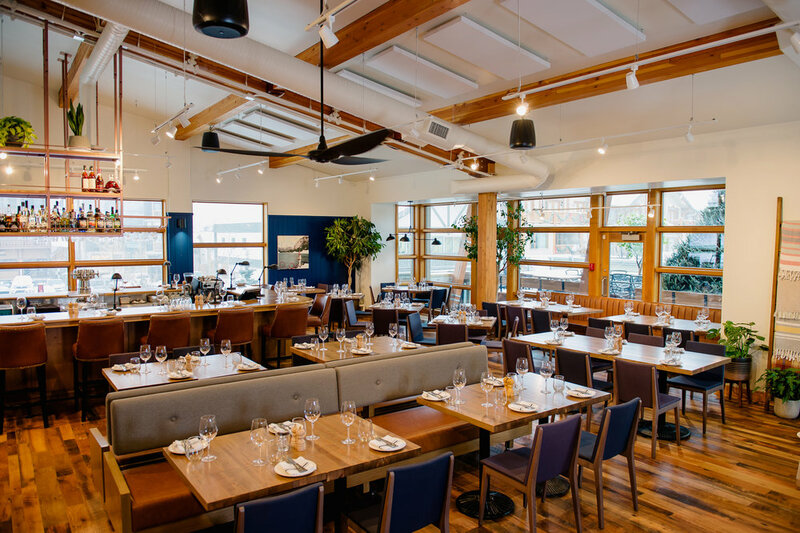 From our modern open concept dining room, to our sun drenched mountain-view terrace, you’ll find the perfect location for your next event in downtown Banff. The Bison is quickly becoming known as the premier venue for intimate, Rocky Mountain events. Our modern, open-concept space features breathtaking mountain views while our display kitchen provides a glimpse of what is to come. Have a pre-dinner reception around our oval bar, feast on regional specialties in our intimate dining room, and then wrap up a perfect night with after dinner drinks under the stars on our roof top terrace. The Bison is an ideal venue for cocktail style parties featuring exciting chef tasting tables, a fresh oyster bar & hors d’oeuvre stations. Complete your event with a live band or DJ, the Bison also offers space for dancing. We recommend pre-selecting wines for your event which allows the host to enjoy the start of the evening while providing an elevated service experience. Our Wine Director has carefully chosen a select list of versatile wines that appeal to an array of tastes and pair perfectly with our group menus. When you preselect wine, we stock these for your event and your dedicated service team will automatically offer these wines to your guests upon arrival and throughout the dinner service. It is not necessary to preorder a certain number of bottles, you are simply charged by the bottle based on what your party consumes. If you would like to choose wine from a more extensive selection, please ask your Group Sales Manager and we will connect with our Wine Director to find the perfect wine for your event. To ensure availability & meet order deadlines, wine selections must be confirmed with your Sales Manager no later than 3 weeks before your event. Please note, restaurants carry a limited quantity of each wine on our menu. Without pre-ordering, we cannot guarantee we will have adequate quantity of certain wines in house. $50 Five Peaks White Blend, Okanagan, B.C. $52 Mission Hill Estate Pinot Gris, VQA Okanagan, B.C. $65 Tinhorn Creek Chardonnay, VQA Okanagan, B.C. $86 Kettle Valley Pinot Gris, Naramata Bench, Okanagan, B.C. $55 Five Peaks Red Blend, Okanagan, B.C. $81 Moon Curser Syrah, VQA, Okanagan, B.C. Our Chef has designed our group menus to include vegan, vegetarian, gluten free, dairy free, nut free and shellfish free options. Dietary indicators are conveniently noted next to each menu item so guests can order with ease. Please note, we are not able to significantly change or substitute items and dishes are plated as described. If we do not have the AV equipment you require, rentals can be arranged through Freeman AV Banff. Please note, certain restrictions on AV, sound and microphone use apply to different rooms and types of bookings. Please confirm what is permitted with your Sales Manager. * Rates vary by season and day of the week. * Please contact a Sales Manager for exact pricing. * Large parties are required to dine from a group menu. What is the difference between a private and a main dining room booking? A private booking is when the entire venue is closed to the public, giving your group exclusive use of all areas, including mountain view terrace, dining room and lounge. A private booking is always subject to a minimum F&B spend which varies depending on the date and day of the week. A main dining room booking is when tables in the restaurant are reserved for your group dinner but the restaurant remains open to the public. Please note, main dining room groups are seated at dinner tables upon arrival (there is no space for standing cocktails). A minimum spend is the amount that you are required to spend on food and beverage before 5% tax and 18% gratuity are applied. Items such as food, wine, and drinks count towards a minimum spend. If the minimum spend requirement is not met, the difference will appear as a room fee on the final bill. *Please note, the doorway entrance is 28.5" wide which allow for standard wheelchair access. May we hold our ceremony in the restaurant? Our venues are primarily dining rooms, therefore we have very limited ceremony space. On occasion, and only with a fully private booking of the entire restaurant, we may be able to host your ceremony. When can I access the venue to decorate? Access time varies from restaurant to restaurant as some locations are open for lunch service and the space may be in use during the day. Please inquire directly with your Sales Manager regarding access times. Can I drop my décor off at the restaurant the day before or morning of? We have very limited storage available at the venues, therefore we are not able to store décor at the restaurant in advance of the access time indicated by your Sales Manager. After your access time you can leave décor in your reserved area only. Can your staff set our décor? Our staff are unable to set up decor items. We are happy to assist with very basic tasks, such as placing pre-assembled centerpieces and unpacked candles on the dinner tables. Anything that goes beyond this scope (assembling centerpieces, unpacking décor, putting out place cards according to a seating plan, etc.) must be left in the hands of your Wedding Coordinator or friends & family. Special Event Rentals Banff is a local company that aids with set up should more extensive assistance be required. To complete a group booking, we require a booking form to be filled out and sent back with a valid credit card. For events with a minimum spend, a 50% deposit is required at the time of booking. Deposits are refundable up to 60 days prior to the event date. In the event you do not achieve the minimum, a rental fee in the amount required to achieve the minimum spend will be applied to the host bill. Both the host bill and individual guest bills count towards a minimum spend. In the case of separate bills, if the minimum spend is not achieved, the host is responsible for paying a rental fee in the amount required to achieve the minimum spend. The Bison requires a final guest count one week prior to the event date. After this time you will be charged the price of the menu for any ‘no shows’. 30-minute grace period for group reservations. After 45-minutes, group is deemed a no-show. Wines must be finalized three weeks prior to event date. The Bison does not allow guests to bring their own wine (no corkage). The credit card provided on the booking form will be charged for your event unless otherwise specified (in which case a different card is required). In the case of separate bills, the credit card provided will be charged the price of the menu for any ‘no shows’ or any charges not paid in full. All events must be paid in full the day of the event, we do not invoice. We represent 6 different downtown Banff event venues. Let our Sales team be your single point of contact to assist you in the planning of your corperate group, wedding or social group.